"Art is the conveyance of spirit by means of matter". Salvador de Madariaga 1886-1978 Creating art quilts, drawing and painting feeds my creative spirit. My goal here is to share my joy of the spirit of creativity with all who visit. 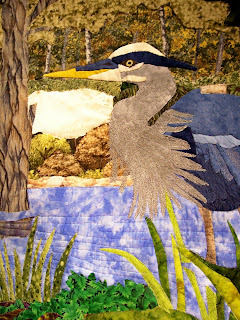 I just got home from attending the West Michigan Quilter's Guild meeting. This was the first time I had attended one of their meetings, as they are about an hour from my home. However, I wanted to go tonight because Velda Newman was speaking about "A Painter's Approach To Quilting", and since I am taking her Creating Realism class tomorrow (nearly today), I wanted to hear her lecture and get a "taste" of her work. All I can say is WOW! I was totally overwhelmed by the beauty of her quilts, but the size of most of them was humongous. 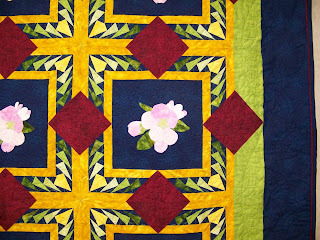 Working so large allows her to make the parts of the quilt, whether it is a flower or a piece of fruit, the size makes it easy for her to put great detail in each piece. Velda told us that she only works on one quilt at a time, and a really large on, like 8 foot by 9 foot, can take two years. She dyes all her own fabric, designs her pattern, does needle turn applique on all her pieces, and often hand quilts some, if not all of the quilt. She tends to use cotton sateen, which, even when dyed, has a slight shine to it, which helps to give her pieces a luminous effect. I really loved her Foxglove quilt. The coloring she did on the petals was exquisite. I forgot to take my camera tonight, but I will definitely have it with me tomorrow! Hopefully we will get to see those quilts again. It's been quite a while since I've posted. I've had some problems with my recovery from the pulmonary emoblisms in December, and have not been up to much. However, I think I'm finally started to see the light at the end of the tunnel. I belong to the Kalamazoo Log Cabin Quilters in Kalamazoo, MI and we just held our annual elections. Though I have been the editor of the newsletter for the guild for the past year, I was just elected to the post of president of the guild, and still plan to continue to do the newsletter. I took jounalism in high school, and have been doing newsletters for organizations I have belonged to, since that time. I love the creative challenge of making all the information fit into a specific format, like putting a puzzle together. I have also had a passion for writing for a long time. Our guild has approximately 300 members and we meet each month of the year. We have local quilters do lectures at most of our meetings, but have nationally know speakers and teachers two to three times per year. This month we just had Helen Squire, who writes the Helen's Hints column for American Quilter magazine. She also taught a one day class on how to decide what quilting designs to use on your UFO's. She was a great speaker, everyone enjoyed her class, and she also donated a book to our library. Our guild also has service projects that we do twice a year. This year, our June project is wheelchair lap robes for people in nursing homes, and for the VA hospital in Battle Creek, MI. Every December we donate stuffed animals with a quilt for each one (usually lap sized) to a women's shelter, the local children's department, and the local mission for homeless people. I look forward to the challenges and joys of leading the way to new adventures for our guild. 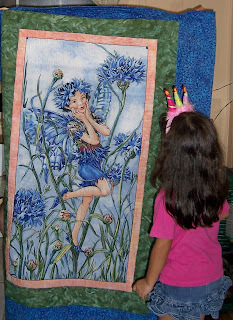 Above is a picture of the quilt I made for my five year old granddaughter, Juanita. This was taken at her birthday party in September, when I was in Florida, visiting my daughter and the grand kids. It was a great visit, and a long time coming, I had not seen them since Juanita was born-5 years ago! It's been soooo long since my last post. After an extremely busy last summer, I was a bit burned out during the fall. I spent most of the fall cleaning my home and reorganizing my studio. Then, I ended up spending the week of Christmas in the hospital after suffering with pulmonary embolisms (blood clots) in both upper lobes of my lungs. Needless to say, that has taken pretty much all the wind out of my sails for a while. I'm now on a blood thinner and am starting to feel better, but I do get short of breath easily, so I still have to take it easy and portion out my energy output. Now that spring is nearly here, and the weather is starting to get better, I am anxious to get busy working on new quilts, and watching my flowers grow and bloom. My lilies are starting to sprout, and my crocuses around my pear tree are peeking up through the leaves. As soon as the ground and the leaves dry out I need to get them raked so my flowers will get more sun. This quilt was made for the FAOL James Birkholm Memorial Raffle. The proceeds of the raffle, which includes many other items, will be used to purchase an engraved stone bench, honoring Jim. The proceeds also will be used to pay for Deanna, Jim's widow, to come to the 2010 Michigan Fish-In, where the bench will be dedicated. The bench will be placed at Gates' Lodge, on the banks of the AuSable river, in Grayling, Michigan, the home of the fish-in. 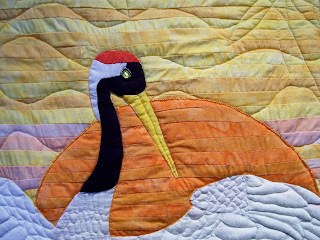 This is a close up of the Heron, showing the thread painting of the feathers on the chest. 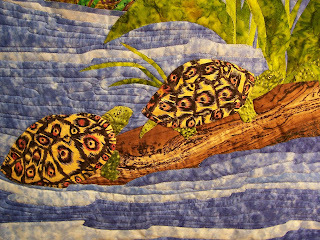 This close up of the turtles shows the quilting of the current in the water. The fabric used for the turtles' shells started out as a black and white leopard print that I colored with Prismacolor Markers. Each section of the shells is a separate piece of fabric, joined and sewn to the background fabric. I absolutely love this quilt and have thoroughly enjoyed making it, I almost hate to give it up! I've finally finished the quilt for my granddaughter, Correen's birthday. Unfortunately, that was on March 26, but I was unable to get done before now because of health issues. Correen had requested a dolphin so she could hang it in their new house. I hope she enjoys it as much as I had fun making it! 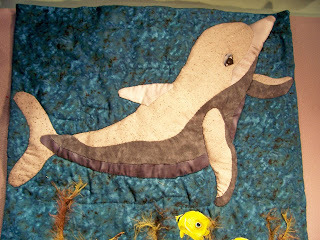 The dolphin is done with needle turned applique and is padded to be three dimensional. 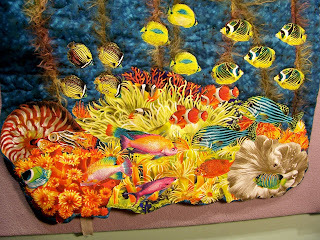 The other fish and coral reef items are all fused applique, then I used a small zig zag stitch to secure them and quilt them at the same time. 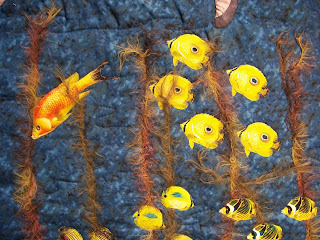 The seaweed is done with eyelash yarn, two pieces sewn down together, with the very tops left loose to blow in the breeze, to give motion to the quilt. 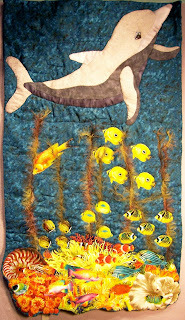 The dolphin is from the Jan/Feb 2008 Applique Society newsletter, the pattern, Sparkle and Friend by Kathy McNeil. Here is a close up showing the seaweed, eyelash yarn. I used the pillow method of finishing the edges of the quilt so that I could have the bottom follow the line of the coral wreath, which was fused and then stitched down. I completed this quilt two years ago and had not put it on my blog because I had hoped to send it out to some shows. Unfortunately, because of my health issues, and being unable to work, I've not been able to afford to do that, so I finally decided to put it up here so that eveyone could enjoy it as much as I have. It took me 18 months to complete this quilt. 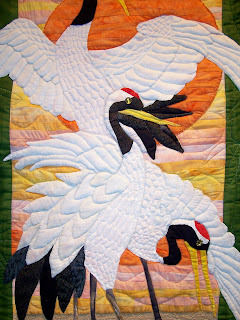 That's from it's the design, to finding all 23 white on white fabrics and 16 black on black fabrics for making the cranes. I actually spent 3 hours picking just the colors for the sunset background and the border. I'm sure the owner of the quilt store thought I would never get finished pulling fabrics and lining them up on the floor. This close up shows the strip piecing of the background, all the strips were 1 1/2 inches wide. The sun was done the same way and then I put irridescent beads around the edge of the sun. I used a crystal bead for the cranes's eyes and then did black irridescent beads around the crystal to give them a lively look. For the quilting in the sky I did wavy lines to suggest air movement. 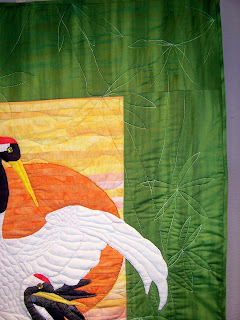 I did free motion bamboo quilting in the border, using a variegate thread. I love it. 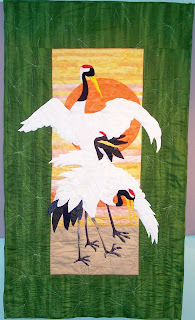 There are over 150 pieces in the three cranes, appliqued together and onto the quilt background. I had to put batting between the birds and the background to block out the background colors and to help give dimension to the birds' feathers. Though it doesn't show up really well in the pictures, I also used colored pencils to help define the edges and shadows of the feathers, and to define the difference between the white parts of the cranes, like the head and the back. 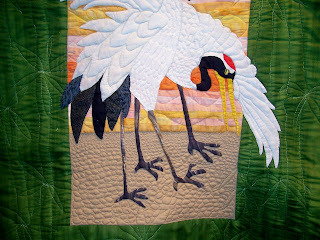 The pebble effect quilting of the ground under the cranes' feet was done free motion, continuous line, with the pebbles being larger at the bottom and getting smaller the farther up I went, to give a sense of dimension to the "ground". This quilt was truly a work of love, and had been talking to me in my head for over a year before I actually started gathering the supplies and actually working on it. I think this is one of my best pieces so far. The Raffle Quilt Is Finished! Whew! I finally have finished the Kalamazoo Log Cabin Quilter's 2009 Raffle Quilt! This was a real challenge for me as I usually do much smaller quilts. 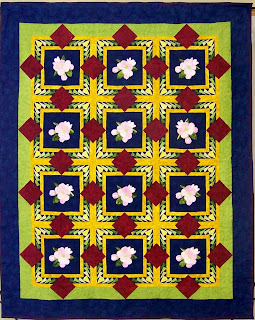 This quilt was adapted from Carol Doak's Michigan Star pattern, from her 50 Fabulous Stars book. I chose this block to adapt since Kalamazoo is in Michigan. 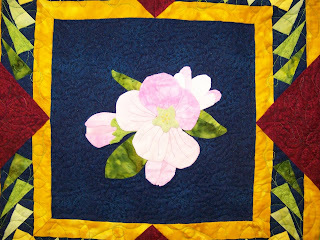 The way I adapted the paper pieced pattern was to eliminate the center part so that we could use a solid piece of fabric for the applique of the apple blossoms. I designed the applique pattern. Apple blossoms are Michigan's state flower. Though they don't show in the pictures, because the quilter used blue thread, there are outlines of robins in the corners of the outer border. Robins are Michigan's state bird. The paper piecing and applique was done by members of the Kalamazoo Log Cabin Quilters. 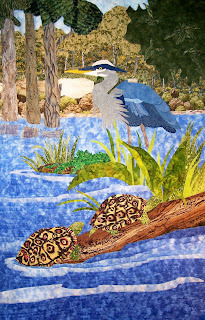 The quilting was done by Karen Kortman, a member and owner of the Bernina Store in Kalamazoo. She did a great job! The proceeds from the raffle ticket sales will be going to local charities. This quilt will be given away at our biannual quilt show this October.